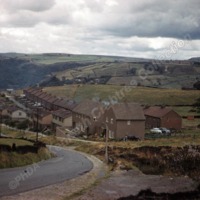 In the centre of the photo Dodd Naze housing on Wadsworth Lane. 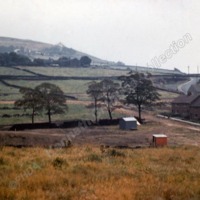 On the right houses on Fairfield and diagonally above them Horsehold and to their right Dodd Naze. 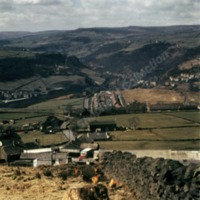 On the right hand hillside houses on the Heptonstall estate. 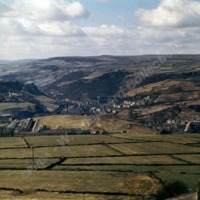 Undated postcard. 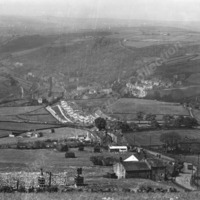 Centre of photo is the Dodnaze Estate with steel fabricated houses built in 1947 fronting onto Wadsworth Lane. 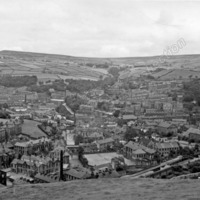 In the centre is Calder Mill with its landmark chimney; the mill was gutted by fire November 1964. 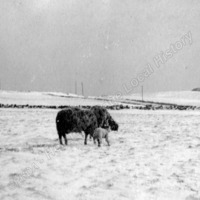 Undated postcard. 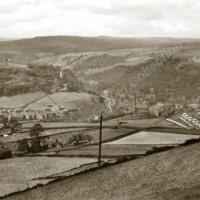 Right of centre is the Dodnaze Estate with steel fabricated houses built in 1947 fronting onto Wadsworth Lane. 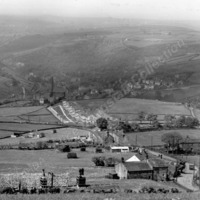 In the centre is Calder Mill with its landmark chimney; the mill was gutted by fire November 1964. 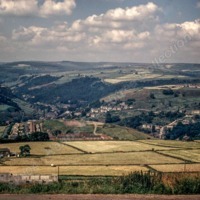 Picture was probably taken from near Mount Skip.